As opioid overdoses and deaths continue to rise in several parts of the country, some advocates and scientists say we aren’t taking full advantage of one tool that may improve the situation: kratom. The U.S. Drug Enforcement Agency reversed a decision Thursday to effectively outlaw the plant, in the midst of research pointing to its possible use as a remedy to opioid addiction. But here at home, kratom remains unauthorized by Health Canada for sale as a consumable natural health product. And there is no evidence that authorities or enthusiasts are pushing for a change. “Health Canada has not authorized any product containing kratom for sale,” Health Canada spokesperson Maryse Durette told Yahoo Canada News. Selling pills, teas, or other ingestible forms of the plant is illegal and perpetrators could face penalties, including shipment seizures at the border or criminal prosecution. However, it is possible to get your hands on kratom in this country. Powder, full leaf, and stems are available legally — provided the products aren’t marketed as consumable. “It’s a grey area,” said Fisnik Veliu of Kratom Canada. A number of websites, including his, advertise and sell the plant for “research,” “spiritual,” and “soap making and aromatherapy” purposes. Kratom Canada, for example, sells its product as an incense. 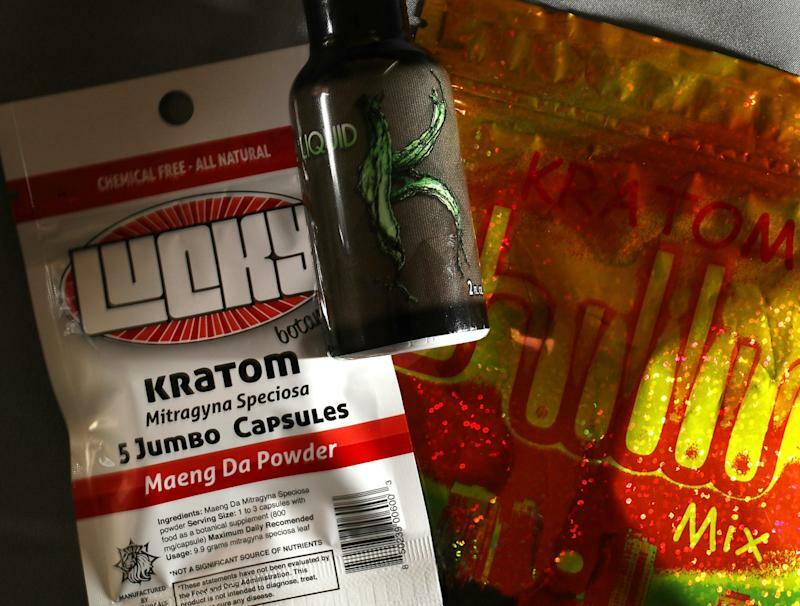 Liquid kratom products are popular in the U.S., Veliu says, but cannot be sold in Canada because they are consumable. Kratom is a hardwood tree native to Southeast Asia’s tropical forests and in the same family as coffee. In that part of the world it’s generally consumed as a tea, though in the U.S. and Canada it is most often taken in capsule form. In Thailand the leaves are chewed by manual labourers in need of a boost, the Bangkok Post reports, though kratom has been illegal in the country for more than 60 years. Why the interest in the plant? Ingesting kratom seems to have some of the same effects as the use of opioids like heroin, and some people have used the plant as a tool to help overcome opioid addiction. It’s estimated that 5 million people in the United States use kratom, Forbes reports, and 134,000 signed a petition against its planned classification as a Schedule 1 substance. Two compounds found in kratom, mitragynine and 7-Hydroxymitragynine, are the main active ingredients in the plant. Both these compounds bind to the same chemical receptors as opioids to provide some pain relief and euphoric feelings but not the same high as drugs like heroin, NPR reports. As part of its decision to allow comments on kratom the DEA also requested that research on kratom by the U.S. Food and Drug Administration be expedited. A 2008 study published in Addiction found that kratom had positive effects for opioid dependence, and researchers at the University of Mississippi and the University of Massachusetts are studying kratom’s role in recovery from opioid dependence. Research on the plant and its potential effects, positive or adverse, continues. The DEA says that kratom has contributed to 15 deaths between 2014 and 2016, but in 14 of those 15 deaths other drugs were also found in the person’s body. The FDA is still studying the safety of kratom. However, the plant’s compounds aren’t associated with the same health risks as other opioids, which include respiratory depression. What is the current legal status in the United States? In August the DEA announced it planned to list the two active chemicals in kratom as a Schedule 1 substances, the same classification given to marijuana and LSD. This would have effectively criminalized the plant’s use as an herbal dietary substance in the U.S., in the same way that the DEA listing of both marijuana and its cannabinoids made it illegal to grow hemp until very recently. After Thursday’s decision, the DEA will take comments until December then make a decision.